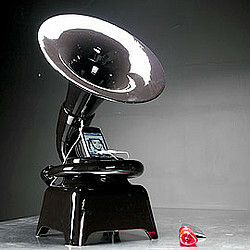 Dock your iPod in a $600 Victrola: "Dock your new music thing into an old music thing. It’s the Phonofone II, Limited Edition in Black and it’s designed by Tristan Zimmerman with only 200 of the devices available for sale. It looks like yet another iPod speaker dock in the shape of a Victrola but this time it’s different, I swear. It uses no power except the power of your iPod Classic or iPod Touch to amplify music through the horn part of the Phonofone II at 55 decibels." 8 Vaguely Named Professions: Explained!